It’s fitting that Jonathan Franzen’s essay collection The End of the End of the Earth begins with a neurotic exploration of the essay format itself. Opening with this kind of self-doubt suggests that Franzen should stick to fiction for a while and regroup with this medium at a later time. The high bar set by his novels and early nonfiction do work against him here, but midcareer stumbles can’t be forgiven solely on the basis of name recognition. 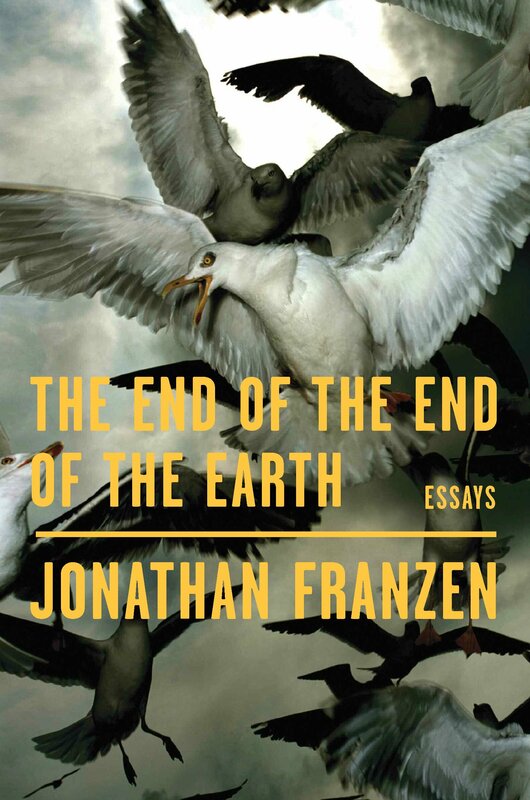 The biggest elephant in the room is actually a bird; nearly all the essays in this collection are pulled into the whirlpool vortex of Franzen’s singular monomaniacal fetish. Any honest response Franzen’s fourth nonfiction publication can only be titled en-NOUGH a-BOUT the-BIRDS. His last essay collection, Farther Away, featured an engaging essay about the bird zeitgeist in Cyprus—its native species, its enthusiastic birdwatchers, and the various threats threats posed by poachers, politicians, and pollution. It appears Franzen thought that essay went a little too well, since he proceeded to write it again four times this time around. He figured that exploring the same topic in different countries might freshen the formula, but it doesn’t. After you’ve heard avian anecdotes in Albania, Jamaica, the Farrallon Islands and Africa, it all starts to sound the same. Titling an essay “Why Birds Matter” is not going to do the trick. Later entries include statements such as “The thing about birds is that…” and “Admittedly, I love birds.” He shows a glaring lack of awareness about this disproportionate focus. Curiously, Franzen is at his best when critically analyzing other artists’ work. Comments on the books of Sherry Turkle make for an interesting meditation on the social media age and the decline of interpersonal communication. He celebrates the writing of former friend Bill Vollman for his offbeat blend of sincerity and irony. The major novels of Edith Wharton are fodder for an attempt to quantify how a protagonist comes to earn reader sympathy. Longtime Franzen readers are familiar with his continual fascination over the truth that all fiction is unavoidably biographical, and the Wharton essay is a real treat in this category. Franzen is better than anybody at describing a book you’ve never heard of and selling you on the idea of reading it; don’t be surprised if your Goodreads to-read list expands every few dozen pages. Franzen spoils the fun when he succumbs to a Dave Wallacean brand of neurosis—one that is fueled by intelligence but makes it nearly impossible to enjoy anything. In his African safari essay, he can’t get past the inclination to perceive the continent as some kind of simulacrum. Instead of seeing grazing zebras and wallowing hippos in their most organic of habitats, he’s preoccupied over how odd it is to be reminded of their artificial-environment counterparts in American zoos. He agonizes over the pressure involved in trying to have a good time. Since the apparent purpose of vacation is to create memories to look back on, there’s barely any mental energy left to enjoy the experience while it’s happening. To Jonathan, a bucket list is mere consumerism. He’s at his most DFW-esque in the titular essay, which recounts his journey to Antarctica on (you guessed it) a cruise ship. Instead of losing himself in a three week adventure to the farthest corners of the earth, he ponders the disturbing collective wealth of the ship’s occupants and second-guesses the motives of his tour guides. In the essay’s most emblematic moment, he worries whether his request to change the ship’s course in hopes of spotting birds just might upset the other passengers. This should be the main lesson Franzen takes away from the finished product of The End of the End of the Earth. Past a certain point, such topical repetition becomes stale and irritating. The Antarctica essay is interspersed with the personal history of his Uncle Walt, who bestowed Franzen the inheritance that funded the glacial odyssey. The tragedy of Walt’s deceased daughter, and the subsequent relationship between Walt and Franzen’s mother, make for the most touching and meaningful moments in the book, harking back to the fascinating introspection in Franzen’s memoir The Discomfort Zone. These personal explorations are so good they deserve their own stage. Next time around, the avian/environmental essays should be afforded their own niche volume for the interested. For the rest of us, please, do continue writing about everything and the kitchen sink.